Fill in your details below and we will let you know within 24 hours if we can get Navegador to you with haste! In the 15th century, the Portuguese Prince Henry the Navigator (Henrique o Navegador) summoned the best cartographers and navigators of his time and instructed them to explore the shores of the African coastline . They thereby won expertise in navigation and shipbuilding, heralding the Age of Exploration and enabling Portugal to later to find a sea trade route to India and China. In the height of its power Portugal controlled the sea trade from Brazil to Japan and attained overwhelming wealth with the trade monopoly on spices. 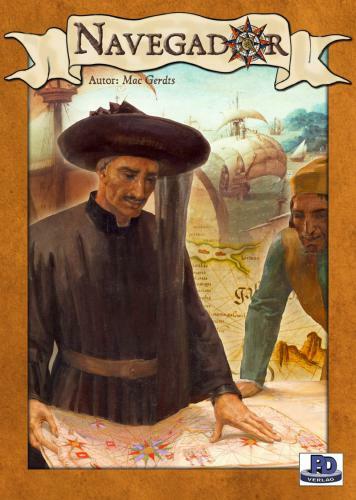 The players represent wealthy trade dynasties that help to build up the Portuguese colonial empire. Tracing the routes of famous explorers they advance all the way to Nagasaki--but sailing into unknown waters is a dangerous venture. Founding colonies and building factories helps them to build up an economic base. But the prices for sugar, gold and spices fluctuate all the time, and only the trade dynasty that adapts to the market will be able to finance its lofty plans. Competing for new discoveries, colonies, shipyards, and churches it is very important to observe the actions of the other players. Each player starts with only two ships and three workers and tries to expand his wealth. At the end of the game the player who is most successful in combining his privileges with his achievements (colonies, factories, discoveries, shipyards, and churches) is the winner.